Following my last post, I was informed of a third Spigot Mortar pedestal surviving. This one was buried under bracken, nettles etc and had clearly been removed from its original location. I suspect it was originally sited within the field, just on the edge of the Covert and was removed after the War (the field is ex-arable). The pedestal is unusual in that it is slightly different to the standard design. It has also been very crudely made, with beach shingle mixed with rubble in a concrete mix. I'm also uncertain if the pedestal was mounted on a concrete base slab- the reinforcing steel rods that the spindle was mounted on (known as the 'birdcage' or 'spider') are normally set into the concrete base slab. The attached images would suggest they were not. The recommended shuttering for the pedestal was a concrete pipe - in this example shuttering seems to have been corrugated iron sheets for the top half - not sure what they used for the bottom half. The pedestal is also tapered. Above: Top two images show the third Spigot Mortar pedestal in the Sandymount Covert area. 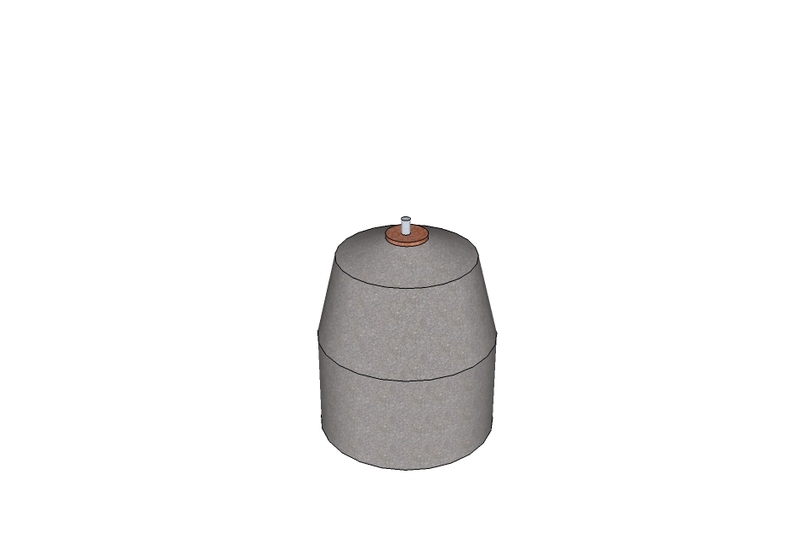 Next two images are google sketchup models of the pedestal (they are not to scale, neither do they show the crude construction). Bottom image is the standard design of the pedestal. Above: Top image shows the crude construction with shingle mixed in with rubble. Middle and bottom image shows the bottom loops of the 'birdcage' which should be set into the concrete base slab - was this pedestal ever set on a base slab?